Wolfpak Decals goes big on this sheet with options for six mostly quite large aircraft, all of them assigned to SAC units. The first is the smallest of the group, a UH-1N assigned to the 37th HS, 90th SMW at FE Warren AFB in Wyoming. This aircraft is from 2011 and is camouflaged in what appears to be the Euro I scheme, something the USAF did away with on pretty much all its aircraft about 15 or 20 years ago. Of course, there is a B-52H. This one is ‘Red Gremlin II’ from the 93rd BS/307 BW, a reserve unit flying out of Barksdale AFB. Right now there are only three bomb wings flying the B-52. The 307th and 2nd at Barksdale and the 5th at Minot AFB. The third option is an FB-111A that was with one of the two bomb wings that flew the type, the 380th at Pease AFB. This is in the SAC greens scheme. Both the FB-111 and Pease AFB are no more. For the last options, we have three 55th Wing planes from Offut AFB. Firs is an RC-135W from September 1996 named ‘Broken Promises’. Next, from 2011 is a WC-135W with a row of atomic symbols on the forward fuselage. 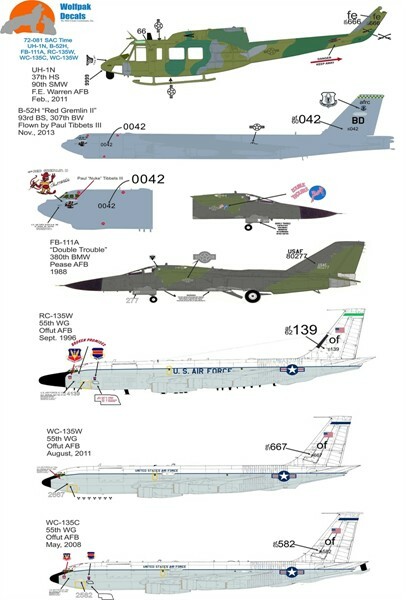 This and the next plane, a WC-135C from 2008 do not have the long nose of the first option. All three have TF-33 engines.